Every boot needs a bit of TLC. Skipping the boring boot care part means that your beloved (and possibly expensive) hiking boots deteriorate at a greatly increased rate of knots.With just a few extra minutes spent after a walk, you could greatly prolong the life of your feet’s best friends. After a walk, clean dirt off under the tap. Seriously mucky boots can be treated with a proprietary cleaner such as Nikwax Cleaning Gel, but most times water and a brush will suffice. Getting rid of the dirt makes it less likely that your boots will dry out and crack. Over the years we have seen several leather boots which had become so extremely dry and cracked that the upper had shrunk and pulled away from the sole. A quick wash and brush up works wonders to prevent this. A quick coating. Once the boot is clean and whilst still wet, apply a water based proofer. If it has been a while since this was done then using a conditioner may be better. Conditioners soften leather as well as waterproof it and are good for breaking in new boots but don’t apply conditioner every time as boots can get too soft and lose some stability. Traditionalists will still prefer to dry boots and then apply a wax paste to proof their boots and while younger walkers might look at this as a lot of effort, it is just how these things were done and nowadays, we have developed products that can be applied in the same fashion but, with less effort. Take the Meindl Sport Wax as an example, goes on like old fashioned dubbing but without atteacting any of the pesky microbes that like to eat into that kind of wax or beeswax. Water based agents will take better care of leather, penetrate deeper into the upper and pick up a lot less dirt and both Nikwax and Grangers make spray on versions of these. Fabric. People often think that fabric boots mean less waterproof but this isn’t true at all. Most hiking boots whether leather or fabric keep out water via a membrane inside the boots, Columbia have even managed to turn their boots inside out to show off their Outdry membrane, but the main point of proofing your footwear is to help them repel water on the outside layer and thus optimise breatheability as the water vapour can pass more freely between dry fibres than wet fibres. Products like Nikwax Fabric and Leather or Granger’s Repel do this very well. Get into the habit. 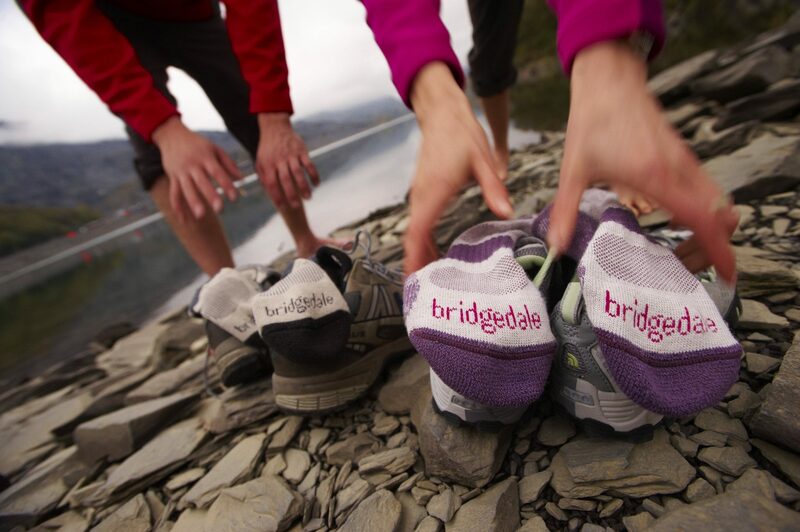 Just remembering to do this once home for a walk can make sure that your footwear is always there for you when an improptu hike beckons or an adventurous walk opportunity appears. Nothings worse than going to get your boots to find that the little bit of mud you picked up on your last walk is now caked into the uppers of your boot and it will take a lot more effort to prep them when you leave it late. To sum up, here’s some handy little videos from Nikwax. And something extra to think about when choosing your boots is the level of care and service that the brand can offer. With that in mind, Meindl offer a re-soling service, among other things. Yes, re-soling. So, after you’ve cared for your boots lovingly over all of your trips, hikes and expeditions, the one part you can’t maintain is the sole. It is designed to wear out, afterall, the grip factor is all dependent on the freeing up of electrons at the molecular level but enough of the science and back to the topic. If you’ve had a pair of Meindl boots, we can send them to the Meindl factory in Germany where the sole will be removed and replaced and the uppers will be given a special makeover. All that time spent getting used to your boots, having them mould to the specific shape of your foot will not be in vain. The service isn’t cheap, €80 for shoes and €130 for boots and not all footwear can be re-soled but it is well worth thinking about when purchasing or if you have a pair of old Meindl boots that might benefit from the maker’s touch. Socks are probably the most heavily worked piece of equipment any walker takes out onto the hill. They have to: protect your feet from impact, friction and abrasion; fill up any excess space inside the boot; maintain as consistent a temperature for your feet as possible; move moisture out of the boot; and fit snugly with minimum slippage. Whatever the brand, high quality socks have some features in common. Technical fibres are knitted in combination to produce socks with a very high stitch density (a lot of loops per square centimetre), firm support, a fitted heel and a very fine toe seam. The fibres vary enormously from wool to polypropylene, silk to acrylic. Different fibres work better depending on the physiology of an individual’s feet but pretty much all quality hiking socks provide a good level of performance while you work out which ones work best for you. We stock a substantial range of socks to cover every type of environment and every type of user, click here to see our full range of outdoor socks. It could be the finest boot in the known universe but if it doesn’t fit you then you are in for a world of hurt and the bad news is that no mass produced boot can possibly fit you. Manufacturers build their shoes around a resin last which is approximately foot shaped. They are a perfect fit for people with resin feet. Your feet are very precisely shaped and they are very different to the feet next to yours at the bus stop. Trying to force your feet into a poorly fitting boot usually means discomfort for you and a seriously shortened lifespan for the boot. The latter is especially true if a foot is grinding around a shoe or boot featuring a waterproof liner. The excess abrasion and scraping of toenails can cause the waterproof liner to fail in a very short time and all down to poor fit causing wear and tear far in excess of what is reasonable or comfortable. The answer is to anchor and support your foot making it more stable and adjust the shoe to fit you a little more. The right sock is essential followed by a supportive insole. A quality insole will support and cushion the foot keeping it in a more consistent position. Less movement = less friction = more comfort.